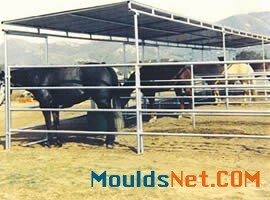 Horse panel shelters provide horses a cool shade and protect them from sunshine & rain in summer or snow in winter. 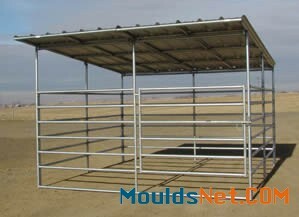 Horse panel shelters have sturdy structure to withstand strong exterior breaking force. The shelters can be stable or permanent. They can be built in the open field, livestock stalls, barns and farms. Can be permanent or flexible. 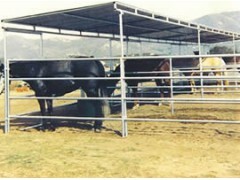 Provide horses and other livestock enough shade. Easy assembly and disassembly with tools. Pipe thickness: 1.6mm - 1.8mm. Panel dimension (H × W): 8' × 12', 8' × 16', 8' × 22', 12' × 12', 12' × 24', 18' × 18', etc. 6' D × 12' W horse shelter roof with 6' legs.